And MM, how did they get that log to grow so round? Around here the red cedars are typically octopus-shaped in cross-section. Looks like what I see all the time, sometimes I get ones worse than that. makes it tricky figuring out the bfage. Figuring bf should be simple because them flutes ain't log. They make great clock blanks. They can be, sometimes. At least, they can be boards. Flitches. Camp lumber. If I was buying they would not be. I would measure inside the flutes, but then I'm not buying. Then again, we usually measure the bfage from the top end, which *might* not be too octopied. My main question would be whether the wood from them would be prone to excessive warping, splitting, etc. OK, I guess that the little end would be smaller that the "inside the flute" measurement. Too much work-not enough pay. Cedar is not prone to warping, bowing, twisting, shrinking, swelling etc. It normally just lays there. Every once in a while you get a log whose boards can do tricks, but rare. Ingrown tends to disappear in the first foot. It is kind of like a knot in FAS lumber. Depends on where it is and how much. If you deduct much on cedar logs, the logger heads to the competitor's mill. Seven logs, sized from 7" to 15" and 271 bf on the cedar scale (they had one off before I got the camera). You think your Tennessee logger will bring me a load? They grow cheaper over your way. A little cedar story. I saved edge trimmings from making blanks for T&G last winter. Sold some for kindling, but gave away most. One of my friends came back yesterday and requested more. He does landscaping and figured out how to make the scraps into a rose trellis. He got a good response and says he can make money. But now he is getting picky and wants the scraps all sawed 1/4" by 1 1/2" without too many knots. Wonder how much I should charge per/bf for this job? Nice logs, Larry. I wish they grew that big on a regular basis around here. I'm always in favor of wild grain patterns. I will be back in the "pink" tomorrow. 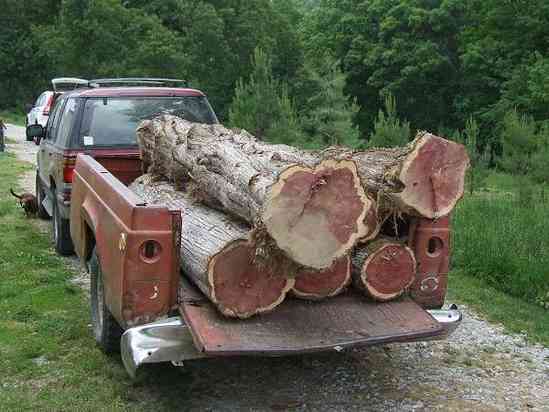 If you have a loader big enough, have the logger put 2 log chains in the bed of the truck cross ways. Go in with forks under a top log and lift the whole load up and have logger drive out from under the lifted load. A few logs can be unloaded first if total load is too big. Keeps from having a pile of pickup sticks when hand unloaded. We can carry a big load to the log pile and then pull the chains out with the loader. Remember to leave a good gap in the chains as they will severly tighten when you set the load down. Page created in 1.372 seconds with 39 queries.